Isn't this a cute little book? It's my watercolor book. The idea has been rolling around in my head since I saw this post. That was such a nice idea and nice little book. 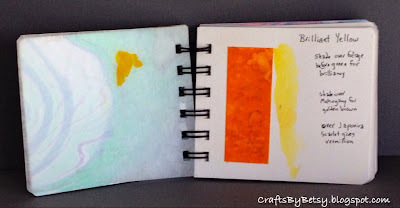 Instead of scribbling color down like Jane did, I decided to use the Peerless watercolors I had in my stash. I hadn't used them in a while and had forgotten just how nice they are. I have the Complete Edition set of 15 color sheets 2 1/2" x 6 1/2" (which ironically isn't the full set of colors, but a nice variety). I only used a strip 1" by 2 1/2" for my book so I still have most of the sheets left. My book is only 3 1/2" x 4" made from watercolor paper, waxed paper as divider sheets, and recycled chipboard for the covers. I included an envelope page that can hold additional sheets of waxed paper to use as disposable palettes. I also had a couple scraps of marbled paper I had done quite awhile ago, and covered both sides of the chipboard with that. In case you want to try the Suminagashi marbling, I used a dye set by Boku-Undo imported by Aitoh that I got at my local art supply store. I used Sundance Cover 65 lb Bright White Felt paper. It holds up well to the technique and has a nice texture. 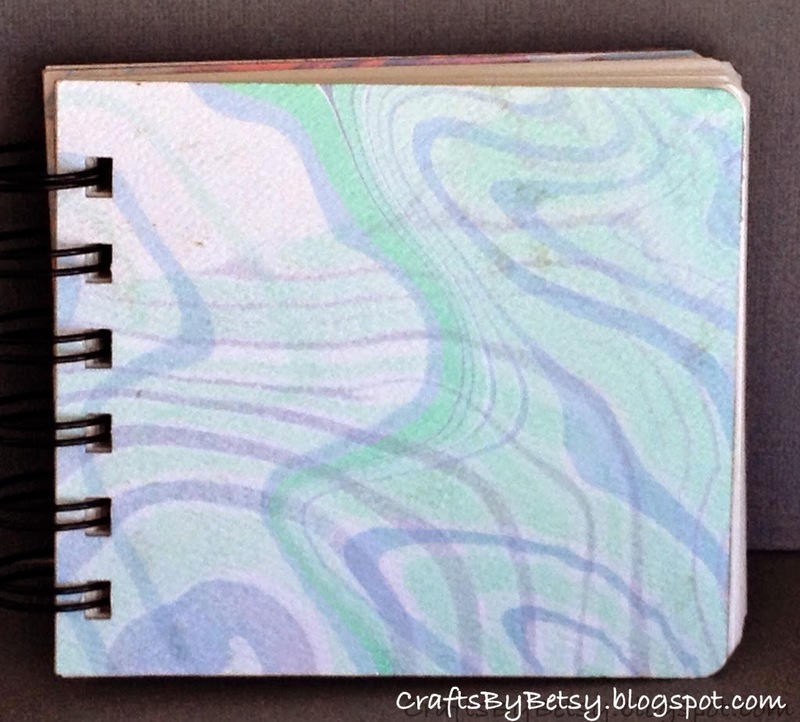 The book is spiral bound with my Zutter bind-it-all. No worries where you see the spot of color on the left, that's actually on the waxed paper separator page. 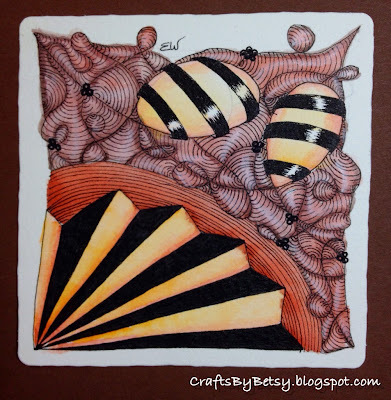 And here is the Zentangle® tile I drew and then watercolored while camping. Tangles used: Avreal, Printemps, Paradox, Hazen, and 'Nzeppel. 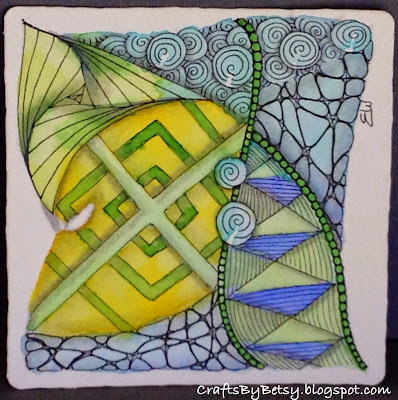 And this tile I did at home, 'cuz these watercolors are too nice to only use traveling. Tangles used, Gneiss, Isochor and Striping. 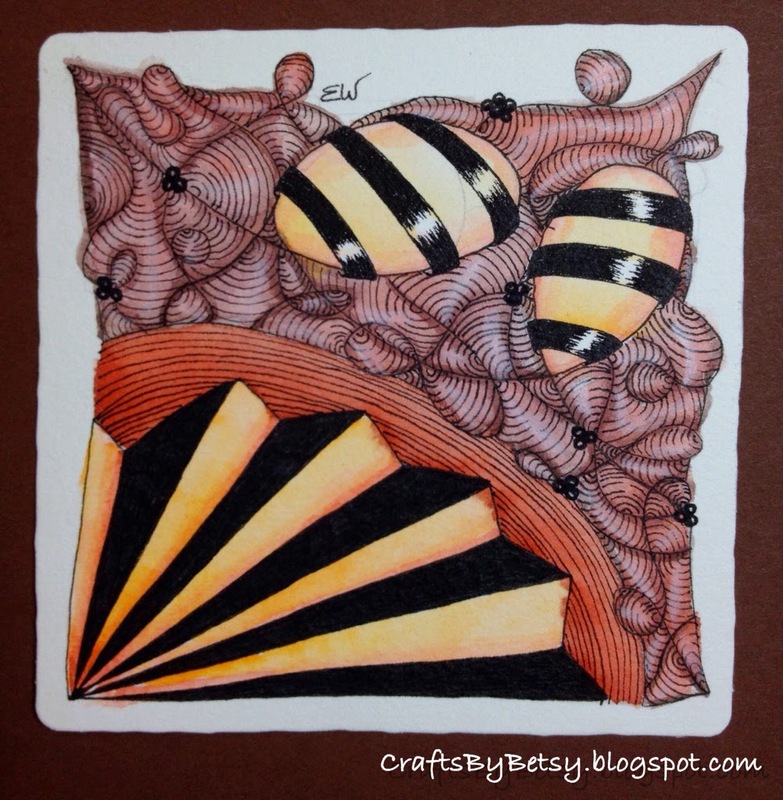 In addition to the Peerless watercolors and Sakura Micron pen I used zenstone. Thanks for the wax paper tip. I am going to add that to the next art journal, and maybe put an envelope of them in the binding as well. The colors are very pretty! Lovely tiles. I don't do watercolor, but love the look. Do you use the wax paper as a protector. I agree this is a good idea. Yes, I almost always close the book or move to a different color page while it's still damp so this protects the facing page. Also I can mix colors on it, or if I just need to pick up a little color, I can do that easier from the wax. The Peerless is really saturated with color and easy to get too much. But, because it is so saturated, I'm sure these small strips will last quite a long time. You should give it a try! So, where are the cookies?